Qutub Minar, one of the most important monuments of India which has been attracting huge crowds over the years is an impressive archeological enticement of the capital of India, Delhi. The tall monument has witnessed many historical ravages over the years. This is a battle now to save this majestic shrine and this difficult battle is fought by the archeological department to save its charm. The motive behind organizing the Qutub Festival is to bring back its old appeal. The festival, organized by the Delhi Tourism, is a part of this resurrection process. This significant cultural event not only showcases the artistic traditions and mores of India but also national and international tourists get the opportunity to know about this striking Indian monument. The tallest brick minaret of the world, the Qutub Minar, depicts an interesting and intriguing Indo-Islamic architectural excellence. 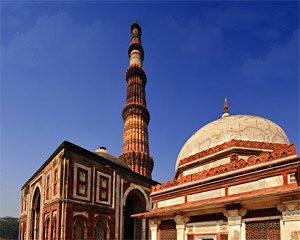 The first Muslim ruler of Delhi had started the construction of Qutub Minar in 1200 AD. This is now included in the list of world heritage sites. In 1368, his son and successor, IItutmish had added three stories to it where as the fifth and last storey was constructed by Feroz Shah Tughlak. Marbles along with red and buff sandstones were used to build the monument. Mostly the marbles were used in the fourth and fifth stories.